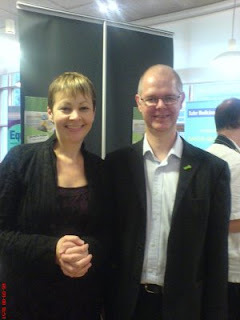 On Friday Caroline Lucas and Adrian Ramsay were elected the first leader and deputy leaders of the Green Party. Yesterday Caroline gave one of the most rousing speeches that I have ever heard. She told the conference: "Just three companies - BP, Centrica and Shell - together made £1,000 profit every second over the first six months of this year. "These corporations are robbing from the poor to give to the rich and they know it. And it's about time they learned that, in a progressive democracy, there is no place for robber barons." There are still a few people in the party who don't like leaders, but I have never been more certain that The Green Party has done the right thing electing Caroline and Adrian. Caroline's speech came straight after a panel session on the Green New Deal with Ann Pettifor, Colin Hines, Jeremy Leggett and Tony Juniper. Amazingly inspirational, the deal calls for nationalisation of money creation (currently in the hands of banks) and the rapid creation of a green industry to reduce our carbon dependency. Keeping people warm, reducing their fuel bills, providing jobs and stabalising the economy are just a few of the many positive outcomes suggested by the GND.